It has been a while since we’ve posted an update here, so I’d like to introduce you to the team’s current project. Hermes 2 is a rebuild of last year’s vehicle with dozens of improvements. Some of the most visible ones include the motor case-as-airframe design (saving several pounds of airframe), ablative leading edges on the fins, addition of a lower avionics bay, containing a data logger and several cameras, and a redesigned avionics bay, with 2 fewer bulkheads and no coupler. The motor will have about 75 kNs and uses an advanced ‘boost-sustain’ thrust curve with 5 BATES grains and 1 Finocyl grain. The propellant is a new formula, developed at MIT to burn longer and stabler at high pressures. Hermes 2 retains the minimum diameter composite fin can of the first vehicle, and the pneumatic single-separation point dual deploy recovery scheme. Hermes 2 will fly 2U worth of cubesat form factor payloads. 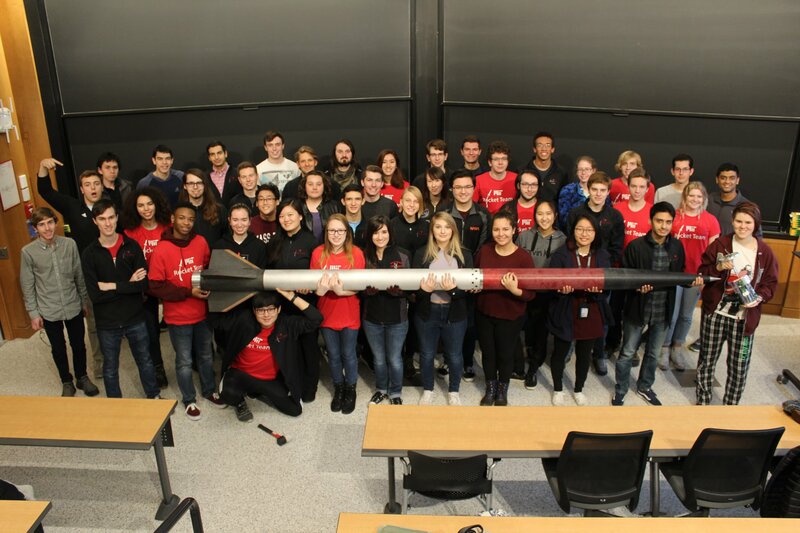 We’re also creating opportunities for High Schoolers to fly Raspberry Pi based payloads on our rocket. We’re also investigating live video telemetry, and nose cone thermal data. Hermes 2 is scheduled to fly at the end of March at Spaceport America, pending a successful static fire of the propulsion system in January. As always, our research and development for this project is posted on our wiki, under the Project Hermes heading. We ultimately hope that this vehicle will be the first stage of our first rocket capable of exceeding the Karman Line, lofting an undesigned second stage sometime in 2020 or later.